Phuket beaches are world renowned as some of the most beautiful in the world. You’re probably coming to Phuket at least in part, for that reason! White sand, small waves or sometimes glassy, and the ultimate in relaxation or wild nightlife… all describe the beaches you’ll find on Phuket Island. With over 50 beaches to choose from, you’re going to have an incredibly good vacation. You’ve picked the right spot! Phuket Island – What is it? Phuket Island is one of the smallest provinces of Thailand, and the largest island in the country by far. Thailand’s next biggest island is Koh Samui off the coast of Surat Thani, at around half the size of Phuket. Most islands are hilly, and Phuket is no exception with seventy-percent of the island being mountainous and hilly, and the rest is plains and valleys where most people live. Phuket is absolutely filled with amazing beaches you and your family can explore. Read on to find out more! Phuket island is a 49-kilometer-long amoeba-shaped island in the Andaman Sea just south of Phang Nga province and connected by the Sarasin bridge. Krabi province is east of Phuket across Phang Nga Bay at only 34 kilometers by air. There is no flight connecting the two places, presumably to allow taxis and boat ferries to make money as well as the airlines. If you want to fly to Phuket from Krabi, you’ll need to fly 800 kilometers to Bangkok, then 800 km. back down to Phuket. If it seems ridiculous, well, this won’t be the last thing you’re scratching your head about after arriving! You’ll be happy to know there are direct flights from Phuket to Koh Samui and Pattaya. As mentioned, Phuket has over 50 beaches on the mainland alone that you can visit during your vacation if you have the time and motivation! If that isn’t enough for you, there are 32 islands surrounding Phuket’s mainland that are also part of Phuket province that you can visit. Most Phuket beaches are bays with rocky outcrops at either end and surrounded by hills – big or small. The west side of Phuket has the most stunning beaches you may have ever seen in your life. The entire west coast is covered with white sand beaches great for swimming, snorkeling, surfing and other water activities. Many of Phuket beaches are kilometers long and lined with ironwood and palm trees. West coast beaches enjoy the famous sunsets Phuket is known for, and it’s fair to say most people on the island are on the west side where Patong Beach is. The east side of Phuket Island is much less rocky and marshier in general, with lots of mangroves rather than beaches. East coast beaches also have a lot of mud mixed with the sand, which is great if you’re a local looking for clams and crabs, but not so great for tourists. The snorkeling, swimming, and surfing is not generally very good on the east side, but there are some exceptions to the rule. Some amazing idyllic beaches on Phuket’s east coast that are worth mentioning are: Laem Ka Yai; Laem Ka Noi; and Cape Yamu Beach. There are said to be 600,000 people living on Phuket Island, and the population is growing dramatically every year. Who lives on Phuket? Phuket locals, born and raised on the island make up a small percentage of the population, and most residents are Thais registered in other provinces who came to Phuket to build businesses in the tourism sector. Estimates of 20,000 to 30,000 expats living on Phuket are probably not exaggerated. There are many foreign-owned businesses in the Patong Beach area especially. You can find restaurants owned by expats from all over Europe, the USA, Canada, India, Vietnam, Australia, and other countries. One of the many good points about Phuket – the assortment of international restaurants is superb! Six-hundred thousand people sounds like a lot until you factor in that there are also another 642,000 average visitors arriving at Phuket International Airport each month during the low season and 760,000 per month arriving during high season! The low-season slow-down is not so remarkable any longer due to Chinese and Russian visitors increasing greatly over the past few years. So, are Phuket beaches always crowded? It depends heavily on your definition of what crowded means to you. If you’re wondering if you’ll be able to find a place to put your beach mat down on the sand to lay down – sure – you can always find space for that, on any beach. There isn’t a beach on the island that gets that crowded except maybe Paradise Beach – a tiny little spot close to Patong that you probably shouldn’t miss. There are so many miles of beaches in Phuket that even the 1.2 million people who are here each month, can’t fill up the beaches. If you think about it, most people in Phuket are here for the party atmosphere. At least at Patong Beach and surrounding beaches. You can avoid the crowds by going in the early morning. Most people with hangovers don’t even get moving until lunch time. You can have six hours of relaxation on a beach – maybe by yourself – until then. Most beaches don’t start seeing any tourists until 9 am. It certainly won’t be crowded on any beach at 9 am. Go early and enjoy some world-class beaches by yourself for a few hours before the crowds wake up. In the Northwest part of Phuket Island are some exceptional beaches you might consider visiting. Bangtao Beach – near top of Phuket, a very wide and long beach that never gets crowded because there are many family-friendly resorts lining the beach and many people don’t spend much time at the beach. Banana Beach – a mellow and visually stunning beach in a remote locale. Naithon Beach – a larger beach with lots of things to do – lots of rentals, food stands, etc. Nai Yang Beach – a large beach with a local vibe to it. One of our favorites. Mai Khao Beach – a very long beach near the Phuket International Airport – stretching miles and miles. Great for kids, and many family-friendly resorts in this area. Pansea Beach – better if you’re staying at either the Amanpuri or The Surin Phuket resort, this is an incredibly beautiful beach with great swimming. Surin Beach – another of our favorites! Surin Beach is our ‘go-to’ beach on the weekends. You might see us here. Don’t be a stranger! Laem Singh Beach – if open, is a lovely beach. This beach is not privately owned, but the land behind the beach is, and the owners often close access from the road. You can still arrive by boat. Kamala Beach – once a very low-key beach that nobody really visited, Kamala Beach has opened up and now has food stands and the occasional visitor. Thavorn Beach – if you want to get out of Patong Beach, just head north past Kamala and find this rather relaxed beach to chill at for a few hours. Patong Beach – party central! The beach where you can have everything you could possibly need within easy walking distance. Patong is not an incredibly scenic beach, but it is long, wide, and has more options than any other beach on the island if you’re looking for something fun to do. Paradise Beach – a private beach west of Patong Beach where you pay to get in. Paradise Beach can get crowded, and the music is playing a bit loud for some people’s taste. The real mind-blower here is the trek over the hill to the boulder-filled cove which is excellent for snorkeling and just exploring the rocks. Freedom Beach – a stunning beach for snorkeling and relaxing. In the northeast of Phuket Island, there aren’t any amazing beaches that you can’t miss. This is a locals’ area where mangroves and mud marshes are the norm. In the southeast of Phuket, there are a few beaches you shouldn’t miss if you can make the time. Rawai Beach – a locals’ favorite for years, this beach has a laid-back vibe and is lined with bars to help you take the edge off life. Many people prefer to stay in Rawai for their entire Phuket vacation, preferring the atmosphere here over elsewhere. Laem Ka Yai Beach – nice soft sandy beach with a view of Koh Lon Island. Laem Ka Noi Beach – just north of Laem Ka Yai Beach, smaller and with a nice restaurant to eat at. Ao Yon Beach – lots of places to eat and shop on the southern end. The northern tip is quiet and is the most beautiful part of this beach. Panwa Beach – a quiet beach with little around. Perfect spot to relax. The beaches we listed according to where they’re found on Phuket Island (above) are pretty much the most beautiful beaches on the island. Keep in mind that people have different ideas of what they think is beautiful. Some think white sand beaches for as far as the eye can see is the most beautiful scene. In that case, Kata Beach, Karon Beach, Mai Khao or Bangtao beaches might be considered perfect. Other people think beaches in small coves surrounded by forest, hills, and rocks are the most beautiful beaches. If that’s your idea of an amazing beach, you’ll probably enjoy Freedom Beach, Nai Harn Beach, Nui Beach, Pansea and Laem Singh beach. Patong Beach – the number one spot on the island for anything involving nightlife, this is the spot to go when you want to find huge numbers of people in one place drinking and having fun. The main road is Soi Bangla (Bangla Road). When you’ve found it, you’ve found the hottest nightlife action in the province, and maybe the country. We certainly prefer it to Pattaya or Bangkok. Kata Beach – Kata is a little town behind the beach that a lot of people prefer over Patong because it isn’t so crazy. There are lots of girl bars and massage spots, but there are also regular bars with expats from all over the world just hanging out for a mellow night. Many people prefer this style of nightlife. Bangtao Beach – the Xana Beach Club is here, which a lot of people enjoy at night. The club is right on the beach and has excellent food and music. You might try it for a night and see if it’s your scene or not. Phuket’s west coast has a lot of family-friendly beaches. The six following beaches are all pretty much the same, with the exception of Patong Beach. The beaches below are long and wide and are never crowded. There are family-friendly resorts along these beaches, and the water is usually calm and fairly safe. The best family beaches that come to mind and that you should research further are the following. Read our article “5 Best Phuket Beaches for Families with Kids under 12” to learn more. Again, the west coast of Phuket has the really good snorkeling spots. For great snorkeling, you need submerged rocks and coral. These beaches have great submerged rocks and rocky coast you can explore with your snorkeling gear. Ao Sane Beach – the water outside Ao Sane Beach is filled with rocks, and the shore is rocky to the west, making it ideal for exploring by snorkeling. Pansea Beach – starting at Pansea Beach and going west, you can snorkel for almost 2 kilometers around the cape where the Amanpuri resort villas are located. Yanui Beach – when the water is calm, Yanui Beach is an ideal spot for snorkeling if you’re interested in a little adventure. There is a small island, Ko Man, about 300 meters off the beach. While you shouldn’t try to swim that distance, you could be caught in a strong current, rent a kayak to get there instead. Banana Beach – with rocks on the south and north ends of the Banana Beach, this spot is great for snorkeling, and it’s an absolutely beautiful beach to spend time when you’re done snorkeling. Laem Singh Beach – one of the most beautiful beaches in Phuket also has great snorkeling on the southern end. The north side has some rocks too, but the better snorkeling will be found in the south. Freedom Beach – also a stunningly picturesque beach! Freedom Beach has great snorkeling at either end where the rocks are. Supplementing that is coral reef covering most of the open bay. Laem Singh Beach – a quiet cove that rarely has too many people, especially when access from the road is closed. Come by boat! Surin Beach – one of our favorite beaches, maybe our favorite on most days. Clean water, soft white sand with beach chairs, umbrellas and blow up chairs. Surin Beach has any sort of convenience you require on the path behind the beach. Nui Beach – a tiny hidden beach surrounded by deep forest and nestled in a valley between hills. Ao Sane Beach – a beautiful spot overlooking a bay full of sailboats, catamarans, and yachts. From this beach, you can see Promthep Cape. Yanui Beach – this beach is usually passed by as tourists are in a rush to get to Promthep Cape. Yanui Beach offers incredible views out over the ocean, has soft sand, and there are usually not too many people on the beach. Is there Any Good Surfing in Phuket? The west coast of Phuket Island gets some great surf every year. Surf swells are active usually around April-May to October-November. The biggest waves are typically during the beginning and end of the ‘surf season’ – so the months above are the best to be here if you’re a surfer hoping to catch some bigger waves of 2 meters high or more. Surin Beach – One of the best surfing beaches in Phuket because it offers something for experienced surfers, and the southern end waves are usually small enough for beginners to try longboarding. Bangtao Beach – this huge beach has many spots with surf breaks during a swell and you can probably find one to yourself! Kalim Beach – when the tide is high, the break over the reef at Kalim Beach can reach 3 meter-high waves! This is a local break, and it is getting more crowded as more people find out about it over time. Kamala Beach – waves break on all tides at Kamala Beach, and though the waves are smaller, they break all up and down the long beach. Kata Beach – waves are on the smaller side at Kata Beach, but they are consistent. This is a great beach for longboard riding. Surf contests held here each year. Karon Beach – short ten-second rides is what you’ll find here, but the reason you might want to come is because you may not see anyone else surfing. It’s quite empty, even with decent surf. Surf with a friend when at all possible because undercurrent is bad all over the west coast. Laem Singh Beach – waves break on all tides here during swells, so Laem Singh Beach is a consistent producer of nice waves. Remember, sometimes it will be closed to access from the road side of the beach, but you can come around in a longtail boat to reach it anytime. If you noticed, there are a few beaches that pop up repeatedly on our lists above. That means you will probably have a great time here, and it will become one of your favorite beaches. Phuket often has beaches on the “Top 50 Beaches of the World” lists by travel magazines and websites. We recommend you spend a lot of time checking out the beaches of Phuket and find the ones that you like best – and return again and again, just like most people do.Read our blog article “17 Best Phuket Surfing Beaches” to to find your prefered surf beach in Phuket. 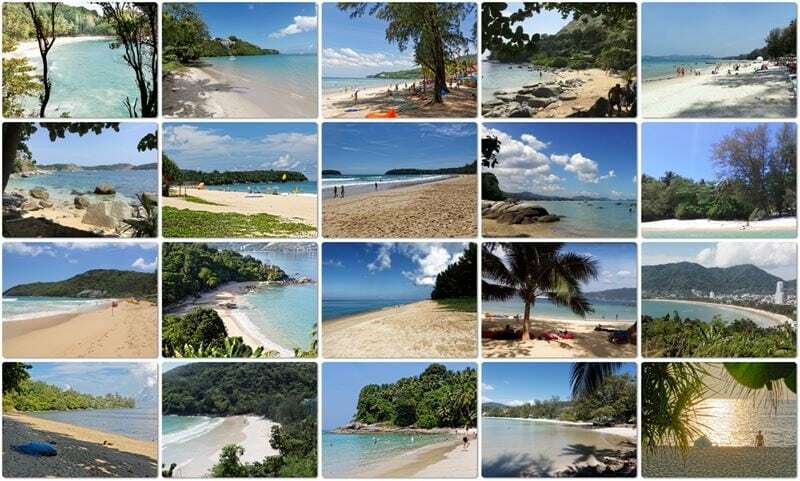 This Phuket Beaches Blog and most of the published articles have been researched, written and compiled by Sepp Hatzl. Sepp started visiting Phuket in 1975, felt in love with the island, and in 1997 decided to spend most of his time in Nai Thon Beach Phuket. Sepp is happy to provide you with more specific information about all kind of Phuket topics, just drop him an email (email see in the footer). This beach is named after the Phuket Pullman Panwa Beach Resort found behind the beach…. Aims to provide visitors with comprehensive, accurate and the latest information on the island paradise of Phuket, especially about the different kind of beaches around Phuket. The information shall help the readers to virtually explore Phuket beaches.